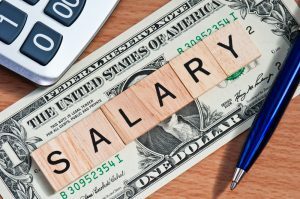 Editor's Salary - How Much Do Editors Make as a Freelancer? An editor’s salary varies greatly. If you want to do freelance editing tasks on a part-time basis, you can regularly make around $500 a month, but if you work for a big firm full time, you can make many thousands of dollars per month (it also depends on the country you work in, but I am mostly speaking about the U.S. here). The great thing about being an editor is that editing is needed in almost every field: business, technology, science, education, marketing, and many more. Your salary will also depend on how much you want to work. If you work only part time (20 hours a week), of course your salary will be less. But if you work full time, especially in an office for a company, you are guaranteed much more money, plus benefits. Editors are highly respected in any field, and often have leadership roles. They are, in a sense, managers. Therefore, they are often paid more than regular employees. However, if you work only as a freelance editor, you can make less because of the lack of a hierarchy. As a professional editor, I have always made more money working in an office for a company than on a freelance basis (mostly through remote proofreading jobs). While working as a freelancer, sometimes payments come in late, sometimes you will work more than stated before, or your employer will give a lot of work for little money. In a company, you have a standard you and the staff have agreed upon. Your work will become more efficient in such an environment, which can convert to more earning potential as well. Editors generally make more than writers, as they have to be more experienced and knowledgeable. Editors should not only write well themselves, but should also have the technical knowhow to correct professional writers, and to make sure everything is consistent with formatting and general information. The highest paid editors are technical editors and publishing editors. Technical editors work mostly in IT and general business, where they look after marketing text, textbooks, guides, and advertisements. Without an editor being hired for IT companies and businesses in general, their websites and promotional materials would not be up to a high standard and would not be presented in a professional way. If the face of the business (its website, marketing material, and so on) is not professionally edited, the mistakes can cause customers to not only distrust their capacity for service, but also let others know about how unprofessional a business is. In some high-ranking businesses and IT companies, if there are errors on websites, within an hour, the business or IT company could face legal troubles, be made fun in a viral way on the Internet, and could lose face for years, if not forever. So, editors can earn a little or a lot of money, depending on how much they work and where they work. The good news is that being an editor is an esteemed position and is usually seen as a management title. This garners more earning potential than most positions. How to Measure Your Goals as a Writer?